You know that your backyard is full of potential. It’s charming, peaceful and provides a relaxing atmosphere that you want to enjoy with family and friends. Unfortunately, though, rough terrain has stood in your way. With a custom deck installed by Topaz Design, you can utilize every inch of your yard in superior style. For those that cherish the beauty of wood, a custom deck can provide a luxurious area for dining, entertaining and lounging. Simply put, decks are a beautiful addition that can help transform your backyard into your own personal sanctuary. Our customized decks are not only tactical, but beautiful, too. Combining our trained eye with your personal taste, we can create a flawless deck that coincides with your budget and expectations. From composite to hardwoods, our team will help you select the materials that will best suit your personal taste and your home’s style. 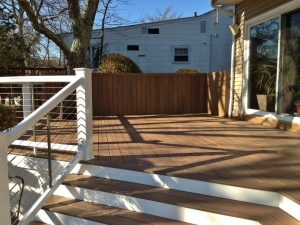 And with our many different railing options, you can get extra creative in personalizing your customized deck. In addition, custom decks boost your property value. With your own specialized deck, you will enjoy a fantastic return on investment should you ever choose to sell your home. To create your very own customized deck, complete our online form today.